For other uses, see The Catcher in the Rye (disambiguation). The Catcher in the Rye is a 1951 novel by J. D. Salinger. A controversial novel originally published for adults, it has since become popular with adolescent readers for its themes of teenage angst and alienation. It has been translated into almost all of the world's major languages. Around 1 million copies are sold each year with total sales of more than 65 million books. The novel's protagonist Holden Caulfield has become an icon for teenage rebellion. The novel also deals with complex issues of innocence, identity, belonging, loss, and connection. The novel was included on Time's 2005 list of the 100 best English-language novels written since 1923 and it was named by Modern Library and its readers as one of the 100 best English-language novels of the 20th century. In 2003, it was listed at #15 on the BBC's survey The Big Read. Holden Caulfield, a teenager from New York City, describes events that took place in December 1949 from an unspecified California institution one year later. Holden begins his story at Pencey Preparatory Academy, an exclusive private school in Agerstown, Pennsylvania, on the Saturday afternoon of the traditional football game with a rival school. Holden has been expelled from Pencey due to poor work and isn't to return after Christmas break, which begins the following Wednesday. He plans to return home on that day so that he will not be present when his parents receive notice of his expulsion. On invitation, he goes to the home of his history teacher, Mr. Spencer. Spencer is a well-meaning but long-winded middle-aged man. Spencer greets him warmly and offers him advice, but embarrasses Holden by further criticizing Holden's work in his subject. Holden returns to his dorm wearing the new red hunting cap he bought in New York. His dorm neighbor Ackley is one of the few students also missing the game. Ackley, unpopular among his peers, disturbs Holden with his impolite questioning and mannerisms. Holden, who feels sorry for Ackley, tolerates his presence. Later, Holden agrees to write an assignment for his roommate, Stradlater, who is leaving for a date. However, Holden is distressed to learn that Stradlater's date is an old friend, Jane Gallagher, on whom Holden had had a crush. When Stradlater returns hours later, he fails to appreciate the deeply personal composition Holden wrote for him about the baseball glove of Holden's late brother Allie, and refuses to reveal whether he slept with Jane. Enraged, Holden punches him, and Stradlater easily wins the ensuing fight. Fed up with Pencey Prep, Holden catches a train to New York City, where he intends to stay in a hotel until he returns home on Wednesday. In a cab, Holden inquires with the driver about whether the ducks in the Central Park lagoon migrate during winter, a subject he brings up often, but the man barely responds. Holden checks into the dilapidated Edmont Hotel. He spends an evening dancing with three tourist women in the hotel lounge and enjoys dancing with one, though is disappointed that he is unable to hold a conversation with them. Following an unpromising visit to Ernie's Nightclub in Greenwich Village, Holden agrees to have a prostitute named Sunny visit his room. His attitude toward the girl changes the minute she enters the room; she seems about the same age as he. Holden becomes uncomfortable with the situation, and when he tells her all he wants to do is talk, she becomes annoyed and leaves. Even though he still paid her the right amount for her time, she returns with her pimp Maurice and demands more money. Holden insults Maurice, who punches him in the stomach and leaves with Sunny. The next morning, Holden, becoming increasingly depressed and in need of personal connection, calls Sally Hayes, a familiar date, and they agree to meet that afternoon to attend a play. Holden shops for a special record, "Little Shirley Beans", for his 10-year-old sister Phoebe. He spots a small boy singing "If a body catch a body coming through the rye", which lifts his mood. After the play, Holden and Sally go ice skating at Rockefeller Center. Holden impulsively invites Sally to run away with him that night to live in the wilderness, but she is uninterested in his hastily-generated plan and declines. The conversation turns sour, and the two part ways. Holden gets drunk at a bar, first calling an icy Sally, then walking to Central Park to investigate the ducks, breaking Phoebe's record on the way. Nostalgically recalling the unchanging dioramas in the Museum of Natural History that he enjoyed visiting as a child, Holden heads home to see Phoebe, exhausted and out of money. He sneaks into his parents' apartment while they are out, and wakes up Phoebe - the only person with whom he seems to be able to communicate his true feelings. Holden shares a selfless fantasy he has been thinking about (based on a mishearing of Robert Burns's Comin' Through the Rye): he pictures himself as the sole guardian of thousands of children playing in a huge rye field on the edge of a cliff. His job is to catch the children if, in their abandon, they come close to falling off the brink; to be, in effect, the "catcher in the rye". Because of this misinterpretation, Holden believes that to be the "catcher in the rye" means to save children from losing their innocence. When his parents come home, Holden slips out and visits his former and much-admired English teacher, Mr. Antolini, who offers advice on life along with a place to sleep for the night. Holden is upset when he wakes up in the night to find Mr. Antolini patting his head in a way that he regards as "flitty" (homosexual). Confused and uncertain, he leaves as dawn is breaking and spends most of Monday morning wandering the city. Losing hope of finding belonging or companionship in the city, Holden impulsively decides that he will head out West and live as a recluse. When he explains this plan to Phoebe on Monday at lunchtime, she wants to go with him, even though she was looking forward to acting in a play that Friday. Holden refuses to let her come with him, which upsets Phoebe, so Holden decides not to leave after all. He tries to cheer her up by taking her to the Central Park Zoo, and as he watches her ride the zoo's carousel, he is filled with happiness and joy at the sight of Phoebe riding in the rain. In a short epilogue, Holden briefly alludes to "getting sick" and living in an institution in California near his brother D.B., and mentions he will be attending another school in September. Holden says that he doesn't want to tell anything more because, surprisingly, he has found himself missing his former classmates. He warns the reader that telling others about their own experiences will lead them to miss the people who shared them. Various older stories by Salinger contain characters similar to those in The Catcher in the Rye. While at Columbia University, Salinger wrote a short story called "The Young Folks" in Whit Burnett's class; one character from this story has been described as a "thinly penciled prototype of Sally Hayes". In November 1941, he sold the story "Slight Rebellion off Madison", which featured Holden Caulfield, to The New Yorker, but it wasn't published until December 21, 1946 due to World War II. The story "I'm Crazy", which was published in the December 22, 1945, issue of Collier's, contained material that was later used in The Catcher in the Rye. In 1946, The New Yorker accepted a 90-page manuscript about Holden Caulfield for publication, but Salinger later withdrew it. The Catcher in the Rye is narrated in a subjective style from the point of view of Holden Caulfield, following his exact thought processes. There is flow in the seemingly disjointed ideas and episodes; for example, as Holden sits in a chair in his dorm, minor events, such as picking up a book or looking at a table, unfold into discussions about experiences. "Old" - term of familiarity or endearment. Bruce Brooks held that Holden's attitude remains unchanged at story's end, implying no maturation, thus differentiating the novel from young adult fiction. In contrast, Louis Menand thought that teachers assign the novel because of the optimistic ending, to teach adolescent readers that "alienation is just a phase." While Brooks maintained that Holden acts his age, Menand claimed that Holden thinks as an adult, given his ability to accurately perceive people and their motives. Others highlight the dilemma of Holden's state, in between adolescence and adulthood. Holden is quick to become emotional. "I felt sorry as hell for..." is a phrase he often uses. It is often said that Holden changes at the end, when he watches Phoebe on the carousel, and he talks about the golden ring and how it's good for kids to try and grab it. Peter Beidler, in his A Reader's Companion to J. D. Salinger's "The Catcher in the Rye", identifies the movie that the prostitute "Sunny" refers to. In chapter 13 she says that in the movie a boy falls off a boat. The movie is Captains Courageous (1937), starring Spencer Tracy. Sunny says that Holden looks like the boy who fell off the boat. Beidler shows (page 28) a still of the boy, played by child-actor Freddie Bartholomew. Each Caulfield child has literary talent. D.B. writes screenplays in Hollywood; Holden also reveres D.B. for his writing skill (Holden's own best subject), but he also despises Hollywood industry-based movies, considering them the ultimate in "phony" as the writer has no space for his own imagination, and describes D.B. 's move to Hollywood to write for films as "prostituting himself"; Allie wrote poetry on his baseball glove; and Phoebe is a diarist. This "catcher in the rye" is an analogy for Holden, who admires in children attributes that he struggles to find in adults, like innocence, kindness, spontaneity, and generosity. Falling off the cliff could be a progression into the adult world that surrounds him and that he strongly criticizes. Later, Phoebe and Holden exchange roles as the "catcher" and the "fallen"; he gives her his hunting hat, the catcher's symbol, and becomes the fallen as Phoebe becomes the catcher. In their biography of Salinger, David Shields and Shane Salerno argue that: "The Catcher in the Rye can best be understood as a disguised war novel." Salinger witnessed the horrors of World War II, but rather than writing a combat novel, Salinger, according to Shields and Salerno, "took the trauma of war and embedded it within what looked to the naked eye like a coming-of-age novel." The Catcher in the Rye has been listed as one of the best novels of the twentieth century. Shortly after its publication, writing for The New York Times, Nash K. Burger called it "an unusually brilliant novel," while James Stern wrote an admiring review of the book in a voice imitating Holden's. George H. W. Bush called it a "marvelous book," listing it among the books that have inspired him. In June 2009, the BBC's Finlo Rohrer wrote that, 58 years since publication, the book is still regarded "as the defining work on what it is like to be a teenager. Holden is at various times disaffected, disgruntled, alienated, isolated, directionless, and sarcastic." Adam Gopnik considers it one of the "three perfect books" in American literature, along with Adventures of Huckleberry Finn and The Great Gatsby, and believes that "no book has ever captured a city better than Catcher in the Rye captured New York in the fifties." Jeff Pruchnic wrote an appraisal of The Catcher in the Rye after the death of J.D. Salinger. In this article, Pruchnic focuses on how the novel continues to be received incredibly well, even after it has aged many generations. Pruchnic describes Holden as a “teenage protagonist frozen midcentury but destined to be discovered by those of a similar age in every generation to come”. However, not all reception has been positive; the book has had its share of critics. Rohrer writes, "Many of these readers are disappointed that the novel fails to meet the expectations generated by the mystique it is shrouded in. J. D. Salinger has done his part to enhance this mystique. That is to say, he has done nothing." Rohrer assessed the reasons behind both the popularity and criticism of the book, saying that it "captures existential teenage angst" and has a "complex central character" and "accessible conversational style"; while at the same time some readers may dislike the "use of 1940s New York vernacular" and other things. In 1960, a teacher in Tulsa, Oklahoma was fired for assigning the novel in class; however, he was later reinstated. 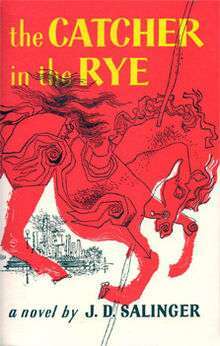 Between 1961 and 1982, The Catcher in the Rye was the most censored book in high schools and libraries in the United States. The book was banned in the Issaquah, Washington, high schools in 1978 as being part of an "overall communist plot". In 1981, it was both the most censored book and the second most taught book in public schools in the United States. According to the American Library Association, The Catcher in the Rye was the 10th most frequently challenged book from 1990 to 1999. It was one of the ten most challenged books of 2005, and although it had been off the list for three years, it reappeared in the list of most challenged books of 2009. The challenges generally begin with Holden's frequent use of vulgar language, with other reasons including sexual references, blasphemy, undermining of family values and moral codes, encouragement of rebellion, and promotion of drinking, smoking, lying, and promiscuity. Often the challengers have been unfamiliar with the plot itself. Shelley Keller-Gage, a high school teacher who faced objections after assigning the novel in her class, noted that "the challengers are being just like Holden... They are trying to be catchers in the rye". A Streisand effect has been that this incident caused people to put themselves on the waiting list to borrow the novel, when there were none before. Several shootings have been associated with Salinger's novel, including Robert John Bardo's shooting of Rebecca Schaeffer and John Hinckley, Jr.'s assassination attempt on Ronald Reagan. Additionally, after fatally shooting John Lennon, Mark David Chapman was arrested with a copy of the book that he had purchased that same day, inside of which he had written: "To Holden Caulfield, From Holden Caulfield, This is my statement". Early in his career, Salinger expressed a willingness to have his work adapted for the screen. In 1949, a critically panned film version of his short story "Uncle Wiggily in Connecticut" was released; renamed My Foolish Heart, the film took great liberties with Salinger's plot and is widely considered to be among the reasons that Salinger refused to allow any subsequent film adaptations of his work. The enduring popularity of The Catcher in the Rye, however, has resulted in repeated attempts to secure the novel's screen rights. When The Catcher in the Rye was first released, many offers were made to adapt it for the screen, including one from Samuel Goldwyn, producer of My Foolish Heart. In a letter written in the early 1950s, Salinger spoke of mounting a play in which he would play the role of Holden Caulfield opposite Margaret O'Brien, and, if he couldn't play the part himself, to "forget about it." Almost 50 years later, the writer Joyce Maynard definitively concluded, "The only person who might ever have played Holden Caulfield would have been J. D. Salinger." Of course I read The Catcher in the Rye....Wonderful book. I loved it. I pursued it. I wanted to make a picture out of it. And then one day a young man came to the office of Leland Hayward, my agent, in New York, and said, 'Please tell Mr. Leland Hayward to lay off. He's very, very insensitive.' And he walked out. That was the entire speech. I never saw him. That was J. D. Salinger and that was Catcher in the Rye. In 1961, Salinger denied Elia Kazan permission to direct a stage adaptation of Catcher for Broadway. More recently, Salinger's agents received bids for the Catcher film rights from Harvey Weinstein and Steven Spielberg, neither of which was even passed on to Salinger for consideration. In 2003, the BBC television program The Big Read featured The Catcher in the Rye, interspersing discussions of the novel with "a series of short films that featured an actor playing J. D. Salinger's adolescent antihero, Holden Caulfield." The show defended its unlicensed adaptation of the novel by claiming to be a "literary review", and no major charges were filed. After Salinger's death in 2010, Phyllis Westberg, who was Salinger's agent at Harold Ober Associates, stated that nothing has changed in terms of licensing film, television, or stage rights of his works. A letter written by Salinger in 1957 revealed that he was open to an adaptation of The Catcher in the Rye released after his death. He wrote: "Firstly, it is possible that one day the rights will be sold. Since there's an ever-looming possibility that I won't die rich, I toy very seriously with the idea of leaving the unsold rights to my wife and daughter as a kind of insurance policy. It pleasures me no end, though, I might quickly add, to know that I won't have to see the results of the transaction." Salinger also wrote that he believed his novel was not suitable for film treatment, and that translating Holden Caulfield's first-person narrative into voice-over and dialogue would be contrived. In 2009, a year before his death, Salinger successfully sued to stop the U.S. publication of a novel that presents Holden Caulfield as an old man. The novel's author, Fredrik Colting, commented: "call me an ignorant Swede, but the last thing I thought possible in the U.S. was that you banned books". The issue is complicated by the nature of Colting's book, 60 Years Later: Coming Through the Rye, which has been compared to fan fiction. Although commonly not authorized by writers, no legal action is usually taken against fan fiction, since it is rarely published commercially and thus involves no profit. Colting, however, has published his book commercially. Unauthorized fan fiction on The Catcher in the Rye existed on the Internet for years without any legal action taken by Salinger before his death. The Catcher in the Rye has had significant cultural influence, and works inspired by the novel have been said to form their own genre. Sarah Graham assessed works influenced by The Catcher in the Rye to include the novels Less Than Zero by Bret Easton Ellis, The Perks of Being a Wallflower by Stephen Chbosky, A Complicated Kindness by Miriam Toews, The Bell Jar by Sylvia Plath, Ordinary People by Judith Guest, and the film Igby Goes Down by Burr Steers. Fantasy writer Harry Turtledove has written a pastiche-parody "Catcher in the Rhine", based on his daughter's mishearing of Salinger's title. In this short story, an unnamed narrator, who is clearly meant to be Holden Caulfield but is unnamed to avoid copyright problems, goes on vacation to Germany and meets characters from the Niebelunglied. This was first published in The Chick is in the Mail, edited by Esther Friesner, Baen 2000 and reprinted in the omnibus Chicks Ahoy! (2010). It was reprinted in Atlantis and Other Places also in 2010. In "Catcher In The Wry" former major league baseball player, Bob Uecker, recounts anecdotes of his years behind the plate and on the road, recalling the antics of his famous teammates, including Hank Aaron, Bob Gibson, Richie Allen, and Warren Spahn. ↑ "CalArts Remembers Beloved Animation Instructor E. Michael Mitchell". Calarts.edu. Retrieved 2010-01-30. ↑ "50 Most Captivating Covers". Onlineuniversities.com. Retrieved 2010-01-30. ↑ Ulin, David L. (2010-01-29). "J.D. Salinger: a gift of words and silence". Los Angeles Times. Retrieved 2013-01-19. ↑ Costello, Donald P., and Harold Bloom. "The Language of "The Catcher in the Rye.." Bloom's Modern Critical Interpretations: The Catcher in the Rye (2000): 11–20. Literary Reference Center. EBSCO. Web. Dec 1, 2010. ↑ "Carte Blanche: Famous Firsts". Booklist. November 15, 2000. Retrieved 2007-12-20. ↑ Magill, Frank N. (1991). "J. D. Salinger". Magill's Survey of American Literature. New York: Marshall Cavendish Corporation. p. 1803. ISBN 1-85435-437-X. ↑ According to List of best-selling books. An earlier article says more than 20 million: Yardley, Jonathan (October 19, 2004). "J. D. Salinger's Holden Caulfield, Aging Gracelessly". The Washington Post. Retrieved 2007-01-21. ↑ Grossman, Lev; Lacayo, Richard (October 16, 2005). "All-Time 100 Novels: The Complete List". Time. 1 2 "The 100 most frequently challenged books: 1990–1999". American Library Association. Retrieved 2009-08-13. ↑ "The Big Read", BBC, April 2003. Retrieved October 18, 2012. ↑ Salzman, Jack (1991). New essays on the Catcher in the Rye. Cambridge University Press. p. 3. ISBN 9780521377980. ↑ Costello, Donald P. (October 1959). "The Language of 'The Catcher in the Rye'". American Speech. 34 (3): 172–182. doi:10.2307/454038. JSTOR 454038. Most critics who glared at The Catcher in the Rye at the time of its publication thought that its language was a true and authentic rendering of teenage colloquial speech. ↑ Brooks, Bruce (May 1, 2004). "Holden at sixteen". Horn Book Magazine. Retrieved 2007-12-19. ↑ Menand, Louis (September 27, 2001). "Holden at fifty". The New Yorker. Retrieved 2007-12-19. 1 2 3 Onstad, Katrina (February 22, 2008). "Beholden to Holden". CBC News. Archived from the original on February 25, 2008. ↑ Svogun, Margaret Dumais (Winter 2003). "J.D. Salinger's The catcher in the Rye". Explicator. 2 (2). pp. 110–113. Retrieved 2008-02-26. ↑ Yasuhiro Takeuchi (Fall 2002). "The Burning Carousel and the Carnivalesque: Subversion and Transcendence at the Close of The Catcher in the Rye". Studies in the Novel. 34 (3). pp. 320–337. Retrieved 2008-02-26. ↑ Shields, David; Salerno, Shane (2013). Salinger (Hardcover ed.). Simon & Schuster. p. xvi. Retrieved 23 August 2015. The Catcher in the Rye can best be understood as a disguised war novel. Salinger emerged from the war incapable of believing in the heroic, noble ideals we like to think our cultural institutions uphold. Instead of producing a combat novel, as Norman Mailer, James Jones, and Joseph Heller did, Salinger took the trauma of war and embedded it within what looked to the naked eye like a coming-of-age novel. ↑ Burger, Nash K. (July 16, 1951). "Books of The Times". The New York Times. Retrieved 2009-03-18. ↑ Stern, James (July 15, 1951). "Aw, the World's a Crumby Place". The New York Times. Retrieved 2009-03-18. ↑ "Academy of Achievement – George H. W. Bush". The American Academy of Achievement. Retrieved 2009-06-05. 1 2 3 Rohrer, Finlo (June 5, 2009). "The why of the Rye". BBC News Magazine. BBC. Retrieved 2009-06-05. ↑ Pruchnic, Jeff. "Holden at Sixty: Reading Catcher After the Age of Irony." Critical Insights: ------------The Catcher in The Rye (2011): 49-63. Literary Reference Center. Web. 2 Feb. 2015. ↑ Dutra, Fernando (September 25, 2006). "U. Connecticut: Banned Book Week celebrates freedom". The America's Intelligence Wire. Retrieved 2007-12-20. In 1960 a teacher in Tulsa, Okla., was fired for assigning "The Catcher in the Rye". After appealing, the teacher was reinstated, but the book was removed from the itinerary in the school. 1 2 "In Cold Fear: 'The Catcher in the Rye', Censorship, Controversies and Postwar American Character. (Book Review)". Modern Language Review. April 1, 2003. Retrieved 2007-12-19. ↑ Reiff, Raychel Haugrud (2008). J.D. Salinger: The Catcher in the Rye and Other Works. Tarrytown, NY: Marshall Cavendish Corporation. p. 80. ISBN 978-0-7614-2594-6. ↑ Andrychuk, Sylvia (February 17, 2004). "A History of J.D. Salinger's The Catcher in the Rye" (PDF). p. 6. Archived from the original (PDF) on 2007-09-28. During 1981, The Catcher in the Rye had the unusual distinction of being the most frequently censored book in the United States, and, at the same time, the second-most frequently taught novel in American public schools. ↑ ""It's Perfectly Normal" tops ALA's 2005 list of most challenged books". American Library Association. Retrieved March 3, 2015. ↑ "Top ten most frequently challenged books of 2009". American Library Association. Retrieved 2010-09-27. ↑ "Art or trash? It makes for endless, unwinnable debate". The Topeka Capital-Journal. October 6, 1997. Retrieved 2007-12-20. Another perennial target, J.D. Salinger's "Catcher in the Rye," was challenged in Maine because of the "f" word. 1 2 3 Mydans, Seth (September 3, 1989). "In a Small Town, a Battle Over a Book". The New York Times. p. 2. Retrieved 2007-12-20. ↑ MacIntyre, Ben (September 24, 2005). "The American banned list reveals a society with serious hang-ups". The Times. London. Retrieved 2007-12-20. 1 2 Frangedis, Helen (November 1988). "Dealing with the Controversial Elements in The Catcher in the Rye". The English Journal. 77 (7): 72–75. doi:10.2307/818945. JSTOR 818945. The foremost allegation made against Catcher is... that it teaches loose moral codes; that it glorifies... drinking, smoking, lying, promiscuity, and more. 1 2 Whitfield, Stephen (December 1997). "Cherished and Cursed: Toward a Social History of The Catcher in the Rye" (PDF). The New England Quarterly. 70 (4): 567–600. doi:10.2307/366646. JSTOR 366646. Retrieved 2012-11-02. ↑ J. D. Salinger. Philadelphia: Chelsea House. 2001. pp. 77–105. ISBN 0-7910-6175-2. ↑ Weeks, Linton (September 10, 2000). "Telling on Dad". Amarillo Globe-News. Retrieved 2011-02-12. ↑ Doyle, Aidan (December 15, 2003). "When books kill". Salon.com. ↑ Hamilton, Ian (1988). In Search of J. D. Salinger. New York: Random House. ISBN 0-394-53468-9. p. 75. 1 2 Berg, A. Scott. Goldwyn: A Biography. New York: Alfred A. Knopf, 1989. ISBN 1-57322-723-4. p. 446. ↑ See Dr. Peter Beidler's A Reader's Companion to J. D. Salinger's the Catcher in the Rye, Chapter 7. 1 2 Maynard, Joyce (1998). At Home in the World. New York: Picador. p. 93. ISBN 0-312-19556-7. ↑ "News & Features". IFILM: The Internet Movie Guide. 2004. Archived from the original on 2004-09-06. Retrieved 2007-04-05. ↑ Crowe, Cameron, ed. Conversations with Wilder. New York: Alfred A. Knopf, 1999. ISBN 0-375-40660-3. p. 299. 1 2 McAllister, David (November 11, 2003). "Will J. D. Salinger sue?". The Guardian. London. Retrieved 2007-04-12. ↑ AJ (2010-01-29). "Why J. D. Salinger Never Wanted A 'Catcher in the Rye' Movie". The Daily Caller. Retrieved 2013-01-19. ↑ "Slim chance of Catcher in the Rye movie – ABC News (Australian Broadcasting Corporation)". ABCnet.au. Retrieved 2010-01-30. ↑ Connelly, Sherryl (January 29, 2010). "Could 'Catcher in the Rye' finally make it to the big screen? Salinger letter suggests yes". Daily News. New York. Retrieved 2010-01-30. ↑ Gross, Doug (June 3, 2009). "Lawsuit targets 'rip-off' of 'Catcher in the Rye'". CNN. Retrieved 2009-06-03. ↑ Fogel, Karl. Looks like censorship, smells like censorship... maybe it IS censorship?. QuestionCopyright.org. 2009-07-07. 1 2 Sutherland, John. How fanfic took over the web London Evening Standard. Retrieved 2009-07-22. ↑ Fan Fiction and a New Common Law'(1997) Rebecca Tushnet, Loyola of Los Angeles Entertainment Law Journal,. vol.17. ↑ Rohrer, Finlo (June 5, 2009). "Why does Salinger's Catcher in the Rye still resonate?". BBC News Magazine. Retrieved 2012-02-12. Graham, Sarah (2007). J.D. Salinger's The Catcher in the Rye. Routledge. ISBN 0-415-34452-2. Rohrer, Finlo (June 5, 2009). "The why of the Rye". BBC News Magazine. BBC. Steinle, Pamela Hunt (2000). In Cold Fear: The Catcher in the Rye Censorship Controversies and Postwar American Character. Ohio State University Press. "For Esmé—with Love and Squalor"
"The Heart of a Broken Story"
"Just Before the War with the Eskimos"
"Last Day of the Last Furlough"
"The Long Debut of Lois Taggett"
"The Ocean Full of Bowling Balls"
"Once a Week Won't Kill You"
"Personal Notes of an Infantryman"
"This Sandwich Has No Mayonnaise"
"A Young Girl in 1941 with No Waist at All"
"The Last and Best of the Peter Pans"